The United States Congress designated the Chassahowitzka Wilderness (map) in 1976 and it now has a total of 23,579 acres (23578.93 acres, technically). 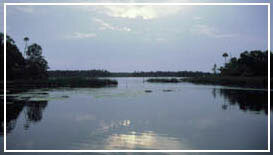 All of this wilderness is located in Florida and is managed by the Fish and Wildlife Service. In the language of the Seminole Indians, Chassahowitzka means "Hanging Pumpkin," although no one seems to remember just how this region earned that moniker. Regardless, Chassahowitzka National Wildlife Refuge encompasses mangrove islands, saltwater bays, estuaries, and brackish marshes, fringed with an oak-cypress-cedar hardwood swamp on the eastern side. Except for a northeastern portion, the entire refuge is designated Wilderness. The Homosassa River runs through the northern Wilderness, while the Chassahowitzka River marks the uppermost boundary of the southern Wilderness. Originally established for the benefit of waterfowl, the area now provides critical habitat to a diversity of wildlife, including endangered species such as the West Indian manatee and whooping crane. The tidal bays, rivers, and creeks of Chassahowitzka NWR provide summer habitat for the West Indian manatee. These gentle aquatic mammals consume 10 to 15 percent of their body weight each day. With some animals exceeding 1,000 pounds, the abundance growth of musk grass in Chassahowitzka's shallow bays provides an important food source for manatees. While manatees frequent the refuge most often during the summer months, whooping cranes can only be seen on the refuge during the winter months. An experimental migratory population of whooping cranes has been migrating to the refuge to winter in the saltmarsh since 2001. Other resident wildlife species include some 250 birds, more than 40 reptiles and amphibians, and 25 mammals. To see these critters (and to get into the Wilderness at all, for that matter), you will need a boat. All watercraft must abide by slow speed restrictions put in place to protect the manatees. The Homosassa and Chassahowitzka Rivers are ideal for canoeing and kayaking and a canoe trail borders the wilderness area along the eastern boundary for about 5 miles. Fishing lures anglers year-round. Camping is prohibited. Planning to Visit the Chassahowitzka Wilderness? How to follow the seven standard Leave No Trace principles differs in different parts of the country (desert vs. Rocky Mountains). Click on any of the principles listed below to learn more about how they apply in the Chassahowitzka Wilderness.